Not only delicious, papaya is low in calories it has a myriad of mineral and vitamin content that provides various benefits for the body. Papaya contains a lot of nutrients, even more interesting is the papaya is very rich in vitamin c. One papaya fruit contains at least 235 mg of vitamin C.
Not only that, papaya also contains other nutrients needed by the body. Call its vitamin A, vitamin E, vitamin K and lycopene, calcium, potassium, folate, magnesium, pantothenic acid, alpha and beta-carotene, and lutein and zeaxanthan. All these nutrients are in the papaya. With a myriad of these nutrients, papaya provides so many benefits. The content of beta-carotene found in papaya is good for the eyes. In addition, its antioxidant zeaxanthin content can also counteract the dangers posed by macular degeneration problems, as well as filter out the dangers of blue light that can harm the eyes. To be able to grow healthy, hair needs to awake moisture. The content of vitamin A contained in papaya can trigger the production of sebum that serves to provide moisture in the hair while making hair grows. Research shows that the pumping content and proteolytic enzyme kimopapain present in papaya can prevent infection in burns and help wound healing. To deal with skin problems such as wounds from lying too long (decubitus ulcers), you can use an ointment containing enzyme papain. The choline content contained in the papaya can relieve chronic inflammation. In addition, the choline content in papaya can help in maintaining cell membrane structure, helps the absorption of fat, is involved in the delivery of nerve excitatory, influential in muscle movement, maintaining memory and learning ability. Papaya contains beta-carotene that the body needs to reduce the risk of asthma. Know why famous papaya can facilitate digestion? This is because papaya is rich in water and fiber that triggers smooth digestion and certainly prevents constipation. Coupled with the presence of papain enzymes that play a role in the process of digestion as a meat grinder. Papaya contains vitamin K which is needed by the body. With enough vitamin K, reduced calcium removal and calcium absorption will increase. In addition, vitamin K can also alter the bone matrix protein, so that the risk of fractures or bone problems is reduced. The reaction of papaya fiber in diabetics can be different. In people with type 2 diabetes, papaya is thought to increase insulin, blood sugar, and lipids. While in people with type 1 diabetes, papaya can actually lower blood sugar. To reduce the risk of heart disease such as cardiovascular, low intake of salt and high potassium is required. A papaya that contains potassium, vitamins, and fiber can be one of the foods that help reduce the risk of heart disease. Papaya contains a good beta-carotene antioxidant to reduce the risk of some cancers. For example is men, taking beta-carotene is thought to reduce the risk of prostate cancer. 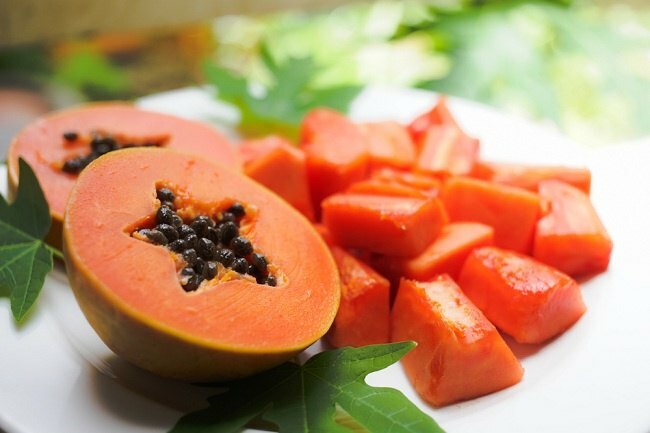 If you do not have an allergy to papaya and the ingredients in it, start to consume papaya. In order for the nutrients needed by the body can be met well, and avoid some diseases.